The orecchiette is a small ear-shaped pasta from Italy that would be ideal for certain recipes. 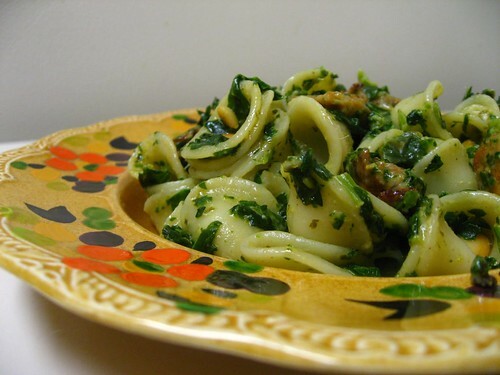 The Sausage and Spinach Orecchiette is one such dish. To prepare the orecchiette you will need /2 pound uncooked orecchiette or small tube pasta, 3 hot Italian turkey sausage links, 1/4 cup chopped onion, 2 garlic cloves, minced, 1/4 teaspoon crushed red pepper flakes, 3 cups fresh spinach, 1/2 cup shreddedAsiago cheese, 1/4 cup grated Parmesan cheese, 1/4 cup rinsed and drainedwhite kidney or cannellini beans, 1/4 cup chopped roasted sweet red pepper, and ½ teaspoon Italian seasoning. First cook the pasta in a pot of lightly salted water until al dente. Add olive oil to the water to prevent the pasta from sticking. The prepare first cook the sausage, onion, garlic, and pepper flakes in a large skillet over a medium flame for 6-8 minutes or until the sausage is well done and drain.Add the spinach and the cheese as well as beans, peppers, and Italian seasoning and continue to cook until the Spinach is done. Drain the pasta and add the sausage and toss and add extra cheese.